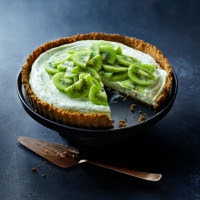 This easy dessert recipe uses sweet and juicy kiwi fruit to top the creamy lime filling and crunchy ginger nut base. An ideal get-ahead pud. 1. Preheat the oven to 180°C, gas mark 4. Line the base of a 23cm loose-bottomed tart case with a circle of parchment. Whizz the biscuits in a food processor until crushed. Add the melted butter and whizz again. Tip into the tart case and press in the base and up the sides with the back of a spoon. Bake for 10 minutes, then set aside to cool. 2. Put the double cream, condensed milk and lime zest and juice into a mixing bowl and whisk together lightly with a balloon whisk. Stir through the mint then pour into the tart case. Chill for at least an hour. 3. Top and tail the kiwi fruit, then use a vegetable peeler to remove the skin. Slice the kiwis, then tumble over the tart. Left over condensed milk is brilliant for making iced coffee, or it can be simmered down to make caramel. It also freezes well.